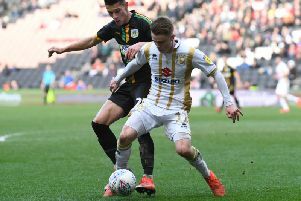 MK Dons dropped to fifth in League 2 after slipping to their second home defeat of the season on Saturday, going down 1-0 to Crewe. Charlie Kirk scored the only goal of the game on 32 minutes, and it was nothing more than the visitors deserved, having controlled much of the play in the opening period. Despite Dons controlling the tempo and most of the ball in the second half though, they failed to find a clear sight of goal, slumping to their fourth defeat in six games. After the 4-3 defeat to Bury last week, Paul Tisdale made just once change to the side, enforced by George Williams' hamstring injury. It meant Conor McGrandles returned on the right flank. New signing Russell Martin was named on the bench, as was Ryan Harley, having not played in the first team since August. It would be the visitors who would make the brighter start at Stadium MK though. James Jones and Perry Ng forced Lee Nicholls into low saves as they controlled the opening half hour. Dons though had two chances in quick succession which should have seen them take the lead. First, Chuks Aneke spun his man to bear down on Ben Garratt's goal, but fired straight at the keeper with Kieran Agard free for a tap in. Then Peter Pawlett had the ball in the net, albeit offside, after good work from Conor McGrandles on the right flank opened up space. And they were made to pay for their missed chances as Crewe took the lead. Left with space on the left-hand side, Charlie Kirk took on Jordan Houghton before lashing past Nicholls. Alex Gilbey was Dons liveliest player in the opening 45 minutes, but probably should have done better when he got down the byline, drawing out Garratt but firing straight at the keeper. Tisdale made a change at the break, introducing Ryan Harley for his first outing since August in the place of Pawlett. And while it livened Dons up going forwards, it did little in finding an equaliser. In fact, James Jones should have done better at the other end in putting the game further out of Dons' reach, but a vital stop from Nicholls kept the deficit at one. The introduction of Osman Sow and Lawson D'Ath later in the half gave Dons a new dimension though as they piled everything forwards in the closing stages. It would be a frustrating finale though as Dons struggled to make a clear-cut chance. Sow, Moore-Taylor and Lewington had half chances but nothing really tested Garratt more than the referee's whistle as he was booked for time-wasting late in the day.